If your home or business has a driveway, a backyard or anything in between, you might as well do something with that area. Home and business owners near Malibu who want to make their property stand out or have a part of it fixed up need look no further. Our team is available for a wide range of outdoor development projects. 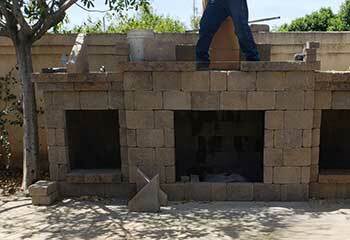 Our services range from complete patio renovation and repair, to installing features like mailboxes and fire pits. If it involves pavers, bricks or concrete, our experts can craft it. Our company employs a team of expert builders, stoneworkers, and other specialists to ensure that our crew has all the skills it needs for any type of paved landscaping project. Since our services include everything from water features to pergolas and much more, flexibility and adaptability have become our most practiced traits. Our team always does their best to work with each customer’s needs, schedule, and preferences, and knows exactly how to make every home or business owner's design wishes come true. There are many options when it comes to paving driveways and walkways, including bricks, tiles, and stones, as well as other materials. With a wide selection of building materials at hand, our team can make sure to develop or remodel your property in a way that perfectly matches your aesthetic preferences and price range. Walls and fences are more than just a way to resolve security issues. They can add a lot to your property's curb appeal, and will influence both its perceived value and its monetary one. As well as deterring intruders, walls of various heights can be used to reinforce roads or garden segments, and protect them from rolling dirt. With some ornate pillars or columns, our team can also construct sheltered gazebos, pergolas, and other open air structures that add to the scenic value of your driveway or backyard, as well as to their utility. A swimming pool is a guaranteed attraction, especially if it has a nice paved deck and outdoor furniture to go with it. Nothing says luxury quite like a swimming pool in the backyard. If you’re short on space or not fond of swimming, there’s always the option of hot tubs, decorative brooks, and small pools for ornamental fish or water plants. Combine it with a paved deck and some built-in chairs or benches, and a water feature can be a perfect resting area or even a centerpiece for your property. Paved ground is the foundation of any kind of landscaping construction. Pavers come in stone, brick, synthetic tile, and many other materials, and can be used to turn a bare patch of soil into a walkable surface the assured firm footing. Connecting different areas of your property with paved paths and stone walkways can contribute to the ambiance and the exterior design, and will also allow you to avoid tracking dirt and mud all over the place. From hopping flagstone archipelagos to cobblestoned paths and even concrete routes, the options are endless. The most important paved feature of most properties is the driveway. Unfortunately, this section also tends to be the paved surface that's most likely to be damaged. Driveways are constantly worn away by vehicles traffic, and rain and other weather events will slowly create crevices and potholes. Not to mention, Mother Nature is always trying to break through. A brick driveway can require a lot of maintenance, especially resealing the grout and replacing damaged pieces. Our team can fix damage to your current driveway or replace it with an entirely new one with a design of your choice. In addition, our experts also offer oil stain removal services to help maintain optimal driving conditions. Barbecue pits are a welcome addition to any outdoor space meant for casual and recreational use, but you can go much further. With the addition of outdoor features like tables, benches, and cooking islands with an abundant counter or bar space, you can have a complete kitchen and dining room area right in your backyard. Whether you want it for private family barbecues or for commercially hosted and catered party events, an outdoor kitchen and dining room setup can be comfortable additions to any lawn or garden. Read our latest work reports to learn more about the recent projects our team completed. 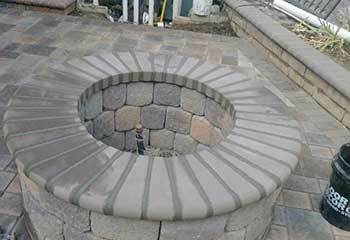 After realizing his fire pit was starting to crack, this customer reached out to us seeking assistance. Read our work report here. 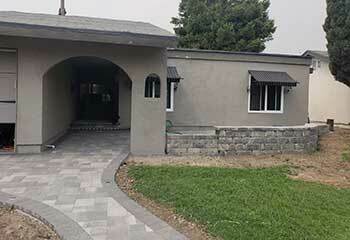 This customer asked us to install a patio for his newly built home. Find out more here. We constructed a brick water feature for this customer’s backyard, designed to match the overall landscape surrounding it. Learn more here. I’m really happy with the new walkway you built around my house. I was really impressed with the quality of your work, and already gave your number to a few neighbors. I couldn’t be happier with my new BBQ Island. You guys got it 100% right! Your work is impeccable and I’ve already been asked for your number a few times! My family's been spending practically all our evenings out by the outdoor fireplace you built in our backyard. I can’t tell you how grateful I am for all your help. Thank you so much!